Finally, the World Series is over. You can start up the hot stove, now. And by the looks of things, it's time to throw a couple of logs on it. Ah, hot stove talk. Reminds me of the days of Fireside Chats, TVs with bunny ear antennas and gas prices being around $1.50. Shoot, gas is $2.19 in Carbondale. It's a shame prices will go up after the election. Because that's how it always happens. And no, you can't blame Barack. But if McCain gets elected, you can definitely blame him! Let's start it off right by talking about the 2008 NL Central Division champion Chicago Cubs. By my calculations (via Cot's Baseball Contracts) the Cubs have $121.8135 million tied into its returning players. That's without arbitration raises. I'm not good at that, so I'll keep my nose out of something I truly do not understand. The Cubs' Opening Day salary was $118.345.833 which was up $18,675,501 from last season. I would expect the payroll to go up by at least that much. There have been some reports that the Cubs payroll could go up to $140 MM or $150 MM. If the Cubs were able to have $30 MM to spend it would mean the Cubs could sign two impact players. 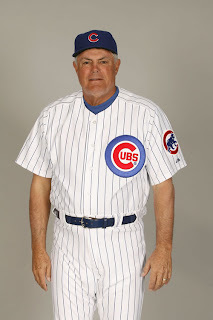 However, GM Jim Hendry should prioritize re-signing Kerry Wood. He wants a three-year deal and since he's been loyal to this franchise since Day 1, he deserves it. You give him a blank check for a two-year deal with a mutual option for a third year. Does $10 MM over three years sound right? It does to me. But it's easier said than done. As for Ryan Dempster, thanks for a great year. The chances of a repeat are slim, so I'd take the two draft picks that would come the Cubs' way to help rebuild the farm system. Dempster would likely command a $14 MM per year salary and if that is the case then the Cubs should try to acquire Jake Peavy. That would likely cost the Cubs a majority of their farm system, but a talent like Peavy is worth it. The Cubs could try to throw Derrek Lee in a deal that would also bring the left-handed power-hitting first baseman the Cub lineup really needs - Adrian Gonzalez. The NorthSide Nine (as of right now) are the NorthSide Eight with the recent news that K-Fuk will be moving to center field as a part of a platoon with Reed Johnson. That mean s right field is available for the following people: Bobby Abreu, Ken Griffey Jr., Raul Ibanez, Milton Bradley, Adam Dunn or even Manny Ramirez. Abreu fits perfectly because he will likely only demand a three year deal and not too much money (which is an odd statement to make seeing that these guys are multi-millionaires.) He plays strong defense, has adequate power (career .498 SLG), speed (22 SBs in '08) and is patient (career OBP of .405) so he sounds like a perfect choice as a No. 3 hitter. The Cubs could also put Mark DeRosa in right field if the Cubs are able to add (dare I say?) Brian Roberts at second base? The Cubs could also move Ryan Theriot and add free agent shortstop Rafael Furcal. Coming Monday. My "dream" team and my projected team. Because Cubs fans can dream, but fans like me are realists. Unlike the guy who wrote these grand ideas.